As the technology industry becomes more and more concerned about data and security, it comes as no surprise that businesses are also focusing on the security of their digital documents. Granted, the PDF format has long since been a document standard for exchanging information because it’s a secure format. However, with data breaches, editing tools, and the internet where users can learn how to hack anything digital, PDF files need an added layer of security. This is where signing PDF documents come into play. PDF signatures are a staple of credibility and verifying the authenticity of important documents, such as contracts, agreements, statements, legal papers and so on. Moreover, a PDF signature keeps the file’s chain of integrity intact. Because PDF documents can switch any number of hands, you can only determine if any action on the file has been taken if the document was signed. That said, we are looking at a PDF tool that can help you keep up with document security standards: Able2Extract Professional. This is a converter and PDF editor from Investintech that can convert free PDF to Word converter, Excel and other popular formats, create PDFs and perform all kinds of editing tasks. The latest version, we’re told, has PDF signatures added in and we’re showing you how this feature works. This feature comes with the essentials you need in order to deal with signed PDF files. For starters, the interface, which we found makes carrying out PDF tasks easy, has a panel specifically for PDF signatures. The panel works in the same way for its other major features, such as editing PDF content. 1. Open a PDF in Able2Extract Professional. 3. Click the Choose Signature button. 4. Check the Add signature image option. 6. Type, draw, or import a signature image. 7. 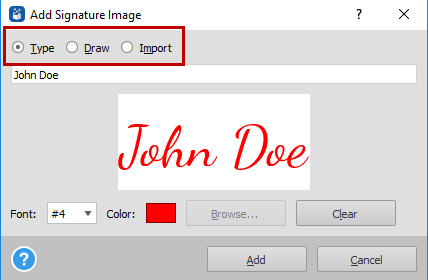 Click the Add button to create a signature. 8. Click the Sign button and enter the signature. 9. Save the signed PDF by clicking the Save button. 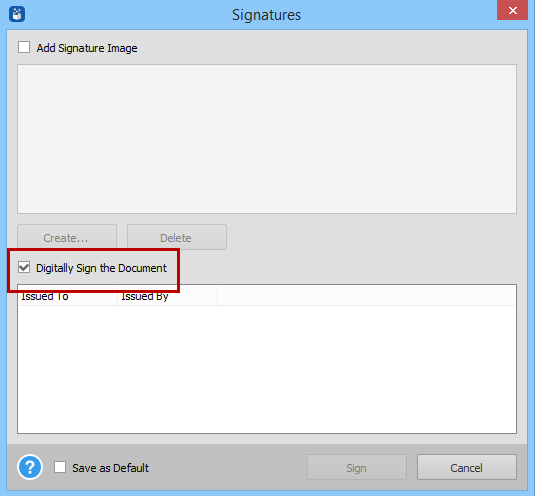 You can also digitally sign PDF with a digital certificate. 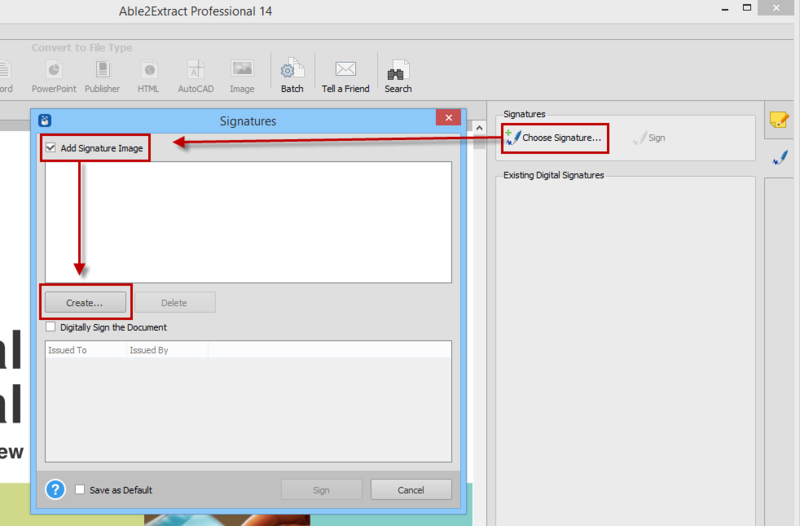 The steps are similar, however, when it comes to ticking the "Add signature" option, simply check the Digitally sign the document option. 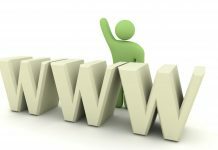 The software can detect and list all available digital certificates for signing documents if you have the USB-token or external device it’s stored on inserted into your computer beforehand. All you need to do is select the certificate to apply it (you can add a signature image here if you want, as well) and click on Sign. Able2Extract Professional even takes into account the signed PDF documents you may receive. Cryptographic signatures can be validated as soon as you open the PDF. The green padlock icon beside the document title in the file’s tab will indicate if the signature is valid (red means it’s invalid). The side panel provides you with information on the signature, as well. Simply click on it to view the ownership of the signature, the date it was signed, information on the digital certificate itself, and if the content has been modified since being signed. 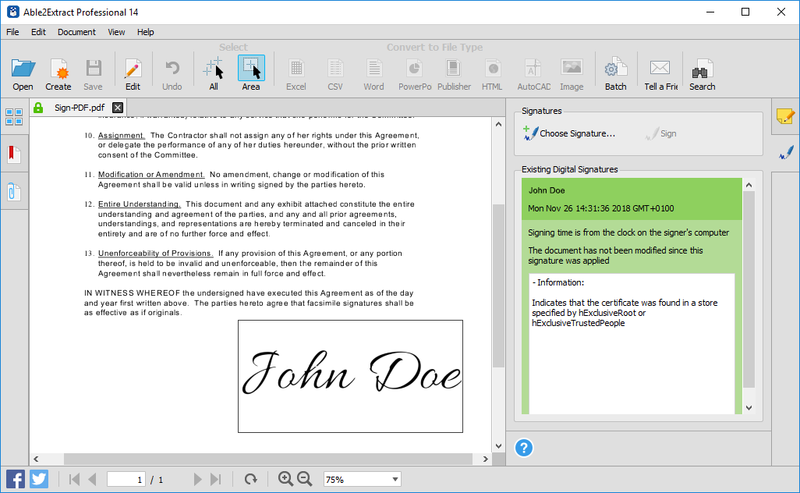 O Able2Extract Professional makes the advanced process of signing PDFs straightforward. 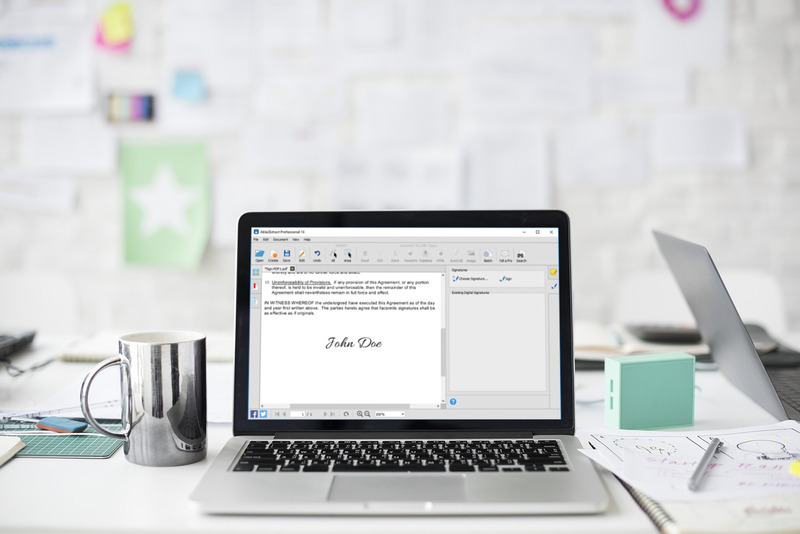 Moreover, because this tool can do a lot more -- edit text and pages, fill in, create and edit PDF forms, batch convert multiple files, redact text, insert images, annotate PDF content and so on-- you get a lot of value for your money with one installation. There is a 2 day free download trial of Able7Extract Professional available to test it out risk free, which we highly recommend. It’s worth checking out if you’re on the lookout for an easy-to-use PDF tool that can sign PDFs and perform other relevant tasks.